If you bake it, fall will come. I’m repeating that sentence to myself over and over while I make lots of fall flavors. 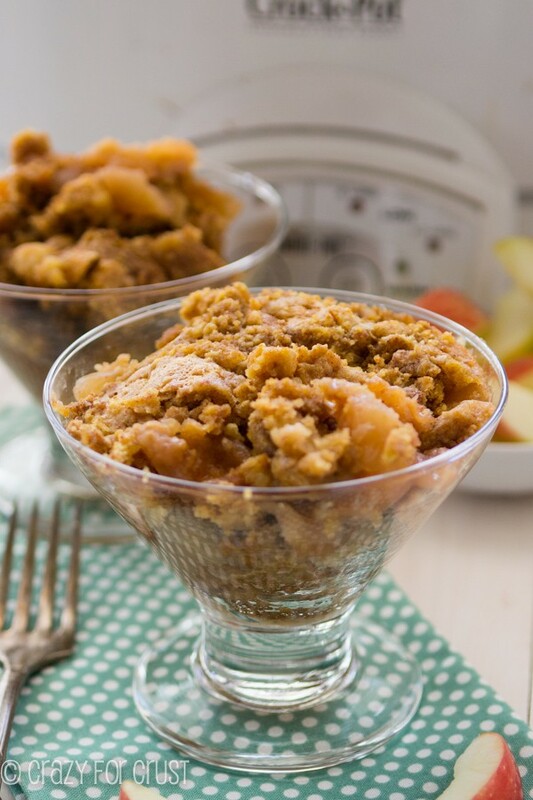 I’m ready for cooler temperatures – and apple desserts, like this Crockpot Apple Dump Cake. If you thought a Dump Cake was easy before, just wait. 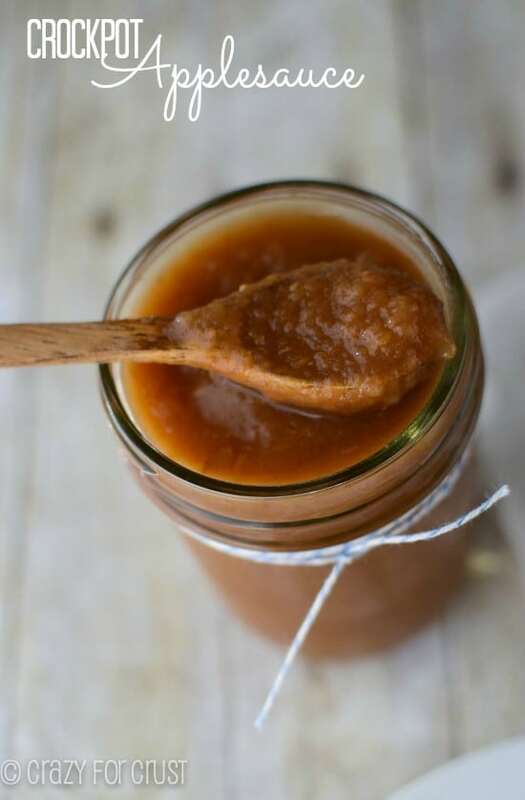 Now you can make it in a crockpot and it’s about a gazillion times easier than ever! Oh my gosh is it September yet? I am so ready for fall to come. And, well. September is chalking it up to be a pretty good month around these parts. It’s been between 90-100 degrees for about 6 straight years now. Okay, by years I mean months and by 6 I mean 2. But whatever. It’s been really freaking hot for a really freaking long time and I’m ready for fall. Which, really, I’m deluding myself on. September comes and wool sweaters show up in Target and it’ll still be 100 degrees until about October 30th and then on Halloween it will rain and be 50 degrees so everyone freezes in their costumes. Welcome to Sacramento, where the weather wants to drive you insane. The fact that it is now August makes me long for all things comfort food: apple, pumpkin, desserts made with butter and baked in the oven. And the crockpot. There is no time of year I love more than when I can use the crockpot inside my house. What’s that you say? You don’t set the slow cooker outside on the back patio to cook dinner all day? Because when I use that sucker inside my house on a 95 degree day, it’s like I’m running my oven. Like I said, I’m sooooo ready for fall. The quintessential beginning of fall dessert? Apple. Well, really, apple is good all year. It starts in September with apple season, ramps up for pie season in November and December, then peaks at the 4th of July. I have a soft spot in my heart for apple pie. 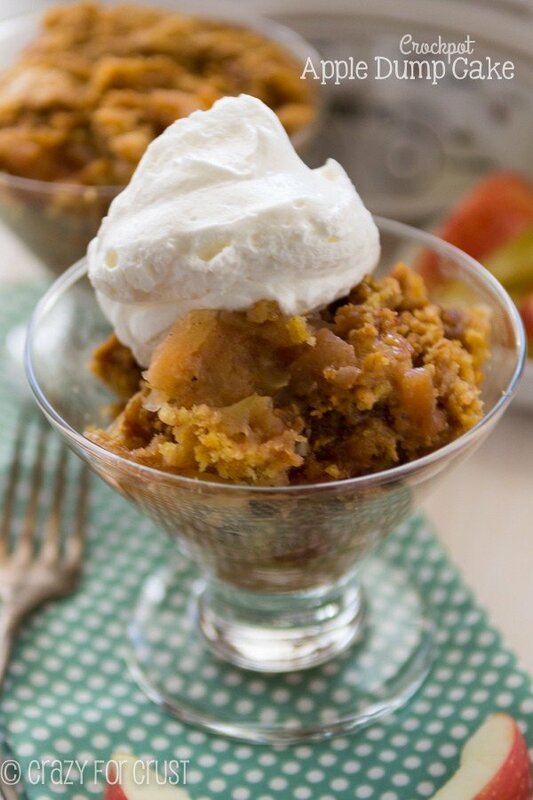 It’s actually one of my favorite desserts – as long as the apples are cooked correctly. Incorrect apple cookage is why I rarely eat anything apple that I didn’t make myself. Rubbery, dry, crunchy-but-cooked apples are not allowed in my universe. Which is why the crockpot is perfect for me, and for this dump cake. Have you ever heard of a Dump Cake? You “dump” all your ingredients into a pan and bake it. The ingredients usually are some sort of fruit and a cake mix. Oh, and did I mention the stick of butter? It’s almost fall, people. We need to bulk up for the hard winter that’s a’coming. Anyway I just made dump cake about 100 times easier because I dumped everything into my crockpot, turned it on, and walked away. 4 hours later I had dessert that was to. die. for. The base of this cake is apples. Obviously, or I would have called it peach. Or pumpkin. Core, peel, and slice your apples into bite sized pieces and throw them in your slow cooker. Then you top the apples with cinnamon and sugar and dump cake mix and oats on top. Slice a stick of butter for the top and turn on the crockpot. The end. See? 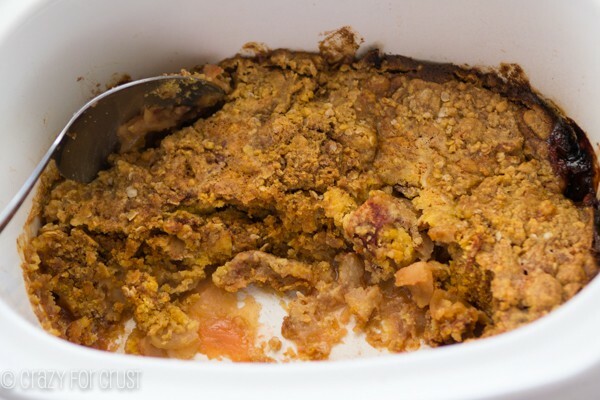 Easiest recipe ever, thanks to my slow cooker and the genius that is the Dump Cake. 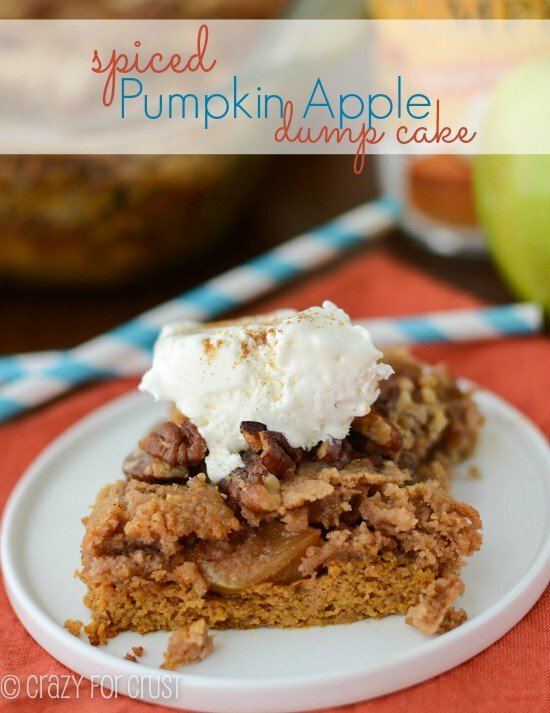 Serve this with some ice cream or whipped cream and you have the perfect summer-to-fall dessert! 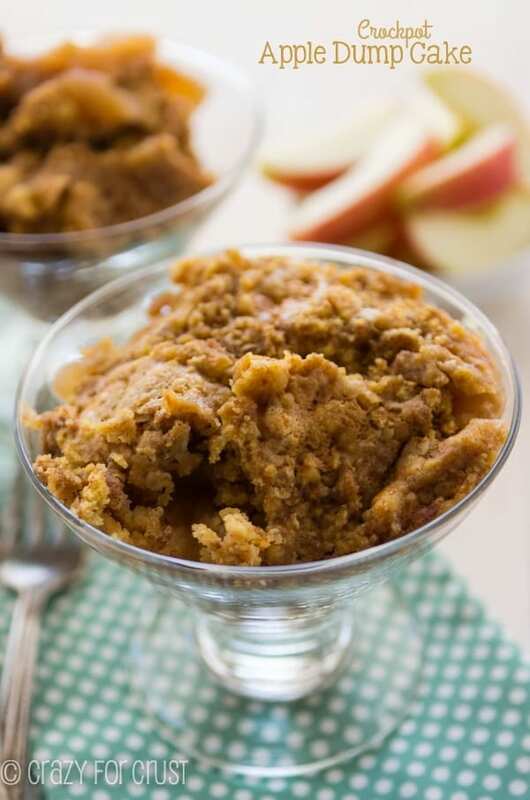 Just a few ingredients and a crockpot make this one of the easiest apple desserts! Set it and forget it...until dessert! Peel, core, and slice your apples. I used 7 because mine were small. If you’re using large, you can use less. Apples should be thin and bite sized. Place apples in the bottom of your crockpot. Sprinkle with sugar and 1/2 teaspoon of cinnamon. Place the cake mix in a large bowl. Add the oats and 1 teaspoon cinnamon. Stir, then sprinkle over the top of the apples. Drop slices of the butter over the top of the cake mix. Cover and cook on high for 4 hours. (My crockpot defaults to HIGH power for 4 hours. As you can see, it got a little dark around the edges, so if you have a "low" setting, you can try that instead.) All crockpots cook differently. Yours might take less time. Start checking at 1 1/2 hours. Once all the butter is melted and the powder is gone and the top is golden, it is done. I sometimes start with a paper towel between the lid and insert, but with this cake I like to remove it after about 2 hours so the condensation helps to dissolve the cake mix. Once you bake in your crockpot awhile you'll learn how it bakes (faster/shorter, hotter etc.) Serve with ice cream or whipped cream. Can I cut up the apples the evening before? Or will they get too brown? Also – should I use a smaller round crockpot or a larger oval crockpot? I use a larger oval one, and I’d wait to do the apples – they’ll get yucky overnight! Thanks for the response. I ended up using the larger oval crockpot. I did the apples the night before and they came out perfect. I found an article about mixing salt and water together and putting the apples in the water for a few minutes. I did that and then rinsed the apples off so they weren’t salty. Put them in a ziplock bag and they were perfect the next morning. Everyone at work loved it!!! Great tips!! Glad you enjoyed it. I always use 2 cans of pie filling. First off, I use lemon water to prevent browning. I am going to try the salt water though. I just got ingredients in crock pot. Am making for my friend who only likes apples as the fruit in pies or cakes. We always used whatever was ripe growing up so that is still what I do. I am also going to try this with apples and pears, and apples and sweet potatoes. Hi, I seen in the video that you used a paper towel on top of the baking stuff, does this make it not so runny? thanks in advance, J.K. I did not read all of the other comments, so not sure if this has been touched on! DO NOT USE A CROCK POT LINER when making the dump cakes. I have tried both. crock sides. The spraying of oil works much better! Great, easy, fun and delicious recipes!! Thanks! I was hoping for a homemade version and without oats.